Amelia Tan sure looks like an ordinary 16-year-old, but most people do not know that she invented a Heater Swimsuit at the age of nine years and won the bronze medal at the Malaysian Invention and Design Society (MINDS) Young Inventor competition in 2003. The invention also gave her the title of the Youngest Inventor in the Malaysia Book of Record together with 10 other young children who got their names in that book. Amelia currently studies at SMK Bandar Utama Damansara (3) in Petaling Jaya. She started inventing things at the age of seven years. Her first invention was a Car Toilet Seat — a potty inserted into a hole in the car seat. She got the idea when she felt a repeated need to use the washroom when travelling in a car. This would be particularly inconvenient during traffic jams and long journeys. So she decided that a car toilet seat would help solve the problem. Her famous invention, the Heater Swimsuit, which won her an award, was created when she could not stand the cold temperature of the water while she was swimming. From that experience came the idea for her invention. What she did next was list all the advantages of having a heater in the swimsuit as well as how it would work. She also drew a sketch of what it would look like. She then shared the idea with her father, who identified the right materials for the project, before she turned the plan into a real object. The problems she had and turned into solutions not only won her an award but also a chance to shake hands with Tun Mahathir Mohamed, the Prime Minister, during the award ceremony. 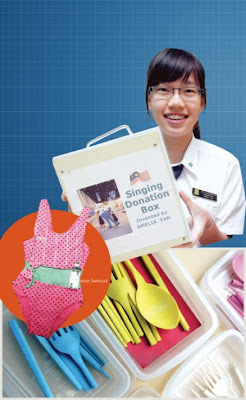 Among her other inventions are a Pet Finder, a Combo Spoon and a Singing Donation Box. However, all her inventions are just prototypes, which are not for sale. The Pet Finder is a GPS for a pet, which she invented when her pet hamster got lost while she was in school. She put a special GPS chip on her pets to keep track of them. The Combo Spoon is her way of solving the problem of dirty cutlery at the hawker stalls. She invented the Singing Donation Box for the Buddhist Society when she was about 9 or 10 years old. The box, placed next to the donation booth, ‘sings’ a song of gratitude when a donation is made. Indeed, Malaysia has so many great minds who selflessly contribute to society even at a young age. Amelia is certainly one of them. With her creativity and down-to-earth personality, Amelia will be able to reach great heights in her life.